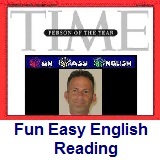 ﻿ Fun Easy English - reading practice and learning about the holiday Christmas Day. The day known as Christmas Day is celebrated on the 25th day of December. (This date is different for Orthodox Christians). It is one of the most important days of the year for Christians—along with Easter when the death and resurrection of Jesus are celebrated. The season of preparing for Christmas is called Advent. Christmas is celebrated all over the world, as a religious holiday or as a time of celebration by Christians and non-Christians alike. The traditions are different from country to country, but they nearly always include a feast, giving gifts or cards, and enjoying church or public festivities such as singing Christmas songs. Santa Claus is a tradition in many countries of the world. Christmastime, as it is often called, is in the winter of the Northern Hemisphere, at a time when there were already ancient festivals. Some of the traditions that are used for Christmas are older than Christmas, or come from other non-Christian traditions such as Yule. Modern traditions of Christmas often focus on the giving of gifts. The season for retail stores to sell gifts, food, greeting cards, Christmas trees, and decorations begins the day after Thanksgiving (in the U.S.), with advertising beginning over a month before Christmas Day. Much of the holiday season in America has lost the original religious meaning and this holiday is no exception. The commercialization of this holiday can be seen all over America especially in retail stores. Americans seem much more preoccupied with gift giving than prayer. This is spreading throughout the world. Places like Japan play traditional holiday music, set up lighted trees, and give gifts, without knowing anything about the religion or the holiday they are celebrating. 1. What does Christmas mean? 2. Christmas for non-Christians is which of the following? 3. The season of preparing for Christmas is called which of the following? 4. Modern traditions of Christmas often focus on which of the following? 5. When does the season for retail stores to sell many things begin?